Have you ever seen such beauty? Let’s frame a sweet potato galette and call it art. First, can we talk about how one of my Instagram friends thought that I was making a galette with BBQ potato chips? That might not be a terrible idea. I should probably find out. Second, this is the most perfect autumn dinner. MOST PERFECT. In my dramatic, way-too-predictable rambles I have to tell you that this tastes like the warm and comforting hug we all need once November rolls around. Crisp and buttery crust. Studded with herbs and flavor. Inside we have caramelized shallots, like REAL caramelized shallots, that I caramelized for over an hour on very low heat. And goat cheese. Lots of tangy, creamy goat cheese. OH! And on top! On top is the best part. It’s essentially a pepita gremolata. Garlic, fresh parsley (I blasphemed the recipe and added a touch of basil too), olive oil, salt, pepper and crushed pepitas. It’s SO good. And I think what makes it so good is that it’s brushed on the galette once it comes out of the oven and gives this hot, rustic dish a fresh bite. I cannot say enough good things. 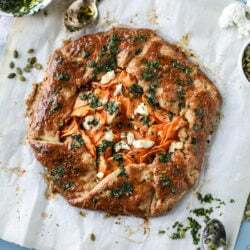 A few years ago I become obsessed with this butternut squash galette. It thrilled me because it has a CHEESE crust (parmesan, what what) and is filled with crispy sage. However! This sweet potato galette is coming in at a verrrrry close second in my own personal galette race, possibly even first because you know how my always-bored millennial brain works. Always wanting something new, so here we go. Also, can we say friendsgiving side dish? I think so. But it can totally be dinner. It’s filling. It’s not horrifically bad for you. It’s not like I used lard for the pie crust (but since I didn’t Mother Lovett is rolling in her grave) and in fact, I think the butter was grass fed. All the justifications please. This, served with a big side salad of spring greens tossed in simple oil and vinegar is my heart right now. It’s not Eddie’s heart. He loved this but he’d never eat it for dinner. With a side of chicken though, YES! Or a side of steak. It’s so many things. A side dish! A main meal! A breakfast when eaten cold from the fridge. A snack when you have leftovers two days later. I love a meal that does quadruple duty. Add the flour, sugar, herbs and salt to a food processor and pulse just until combined. In a small bowl, whisk mix together the egg, vinegar and water. Add the cold butter pieces into the food processor and pulse until small coarse crumbs remain. Sprinkle the water/egg mixture over the flour and pulse again until the dough comes together. Heat the butter in a skillet over low heat. Once melted, stir in the shallots with the salt. Cook on low heat, stirring occasionally, until the shallots are caramely in color, about 35 to 45 minutes. Stir in the brown sugar and cook for 10 more minutes. Remove from the heat and set aside. You can do this while the crust is chilling in the fridge! Slice the sweet potatoes into paper thin rounds using a mandolin. You can truly have as many sweet potatoes as you want in the galette! Remove one of the crusts from the fridge. (The other is good for another week or so, or it can be frozen.) Roll one of the pie crusts into a… “rustic” shape – no shape necessary really – until it is about 1/4 inch thick. Place the dough on a parchment-lined baking sheet. Add the sweet potatoes in the center, alternating layers between sweet potato rounds, caramelized shallots and crumbled goat cheese, leaving a 2-inch+ border of crust. I also like to sprinkle the layers of sweet potato with salt and pepper as I go. Once the filling is added, fold the crust over top of the squash. Brush the crust with the beaten egg wash. Bake the galette until the crust is golden, about 45 to 50 minutes. Remove and let cool slightly before brushing it with the gremolata and serving. Add the pepitas to a food processor and pulse until crushed. Add in the remaining ingredients and pulse until combined. Brush over the galette. What a fantastic way to use sweet potatoes!!!! This galette is seriously calling to me! I would never, ever ever think to use sweet tators this way. I want to make it tonight while we bing watch Poldark on PBS. I finally got my husband on board. Goodness, this looks amazing. Pepita gremolata!? Yes. Sign me up. I think of it every time I hear “buttery crust” !! So good. gahhhh i had not! haha! Oh, this galette looks soo amazing and so rustic! The flavors soo good. I can’t wait to make this! Those crispy edges, KILLING ME! oh oh you must try one heather! This looks wonderful! If I don’t have a mandolin, which would be better: Trying to slice a sweet potato as thin as I can with a knife or dicing the sweet potato like the butternut squash galette? Thanks! carbs on carbs is the best idea ever. and I’m loving that pepita gremolata!!!! 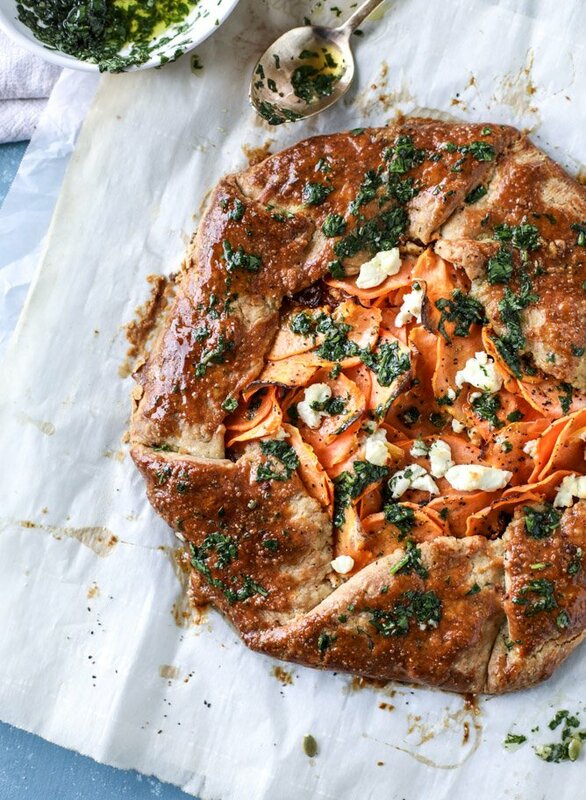 This sweet potato galette is seriously gorgeous! The pepita gremolata sounds out of this world! Those shallots and that pepita gremolata sound SO GOOD! Such a fun tart! thanks katrina! it’s so delicious. Haha it does kind of look like BBQ potato chip pie, now that you mention it! Looks delicious though! My husband doesn’t like sweet potatoes (tragic! ), but I’m dying to make this! haha it sort of does, right!? Do you have an assistant now? this looks delicious! Hi Jessica–A quick question as I was making this yummy-looking galette tonight. In the dough recipe, you state only 1 egg, and then you say to add the egg to the water and vinegar and mix with the dough before chilling. Later you reference an egg wash, but there was only one egg in the recipe. Should the egg have gone into the dough (which is what I did) or wait for the egg wash? Or was there one egg missing from the list of ingredients? Thanks! This is BEYOND incredible Jessica! I just rearranged my Thanksgiving menu. Cheers! Pingback: 9 Vegetarian Main Dishes For Your Holiday Table | Your News On Time! I made this for dinner tonight and it was sooooo delicious!! !